I’m currently off at the cabin taking some time off to rest and unwind before a whirlwind couple of months so accessing the mental state of living the good slow life during our trip to Costa del Sol isn’t too difficult! 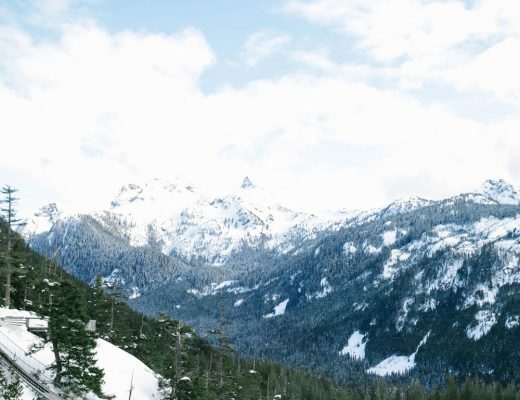 On just about every trip I take, during my research while mapping out our itinerary I’ll always stumble upon a pin and instantly fall in love. 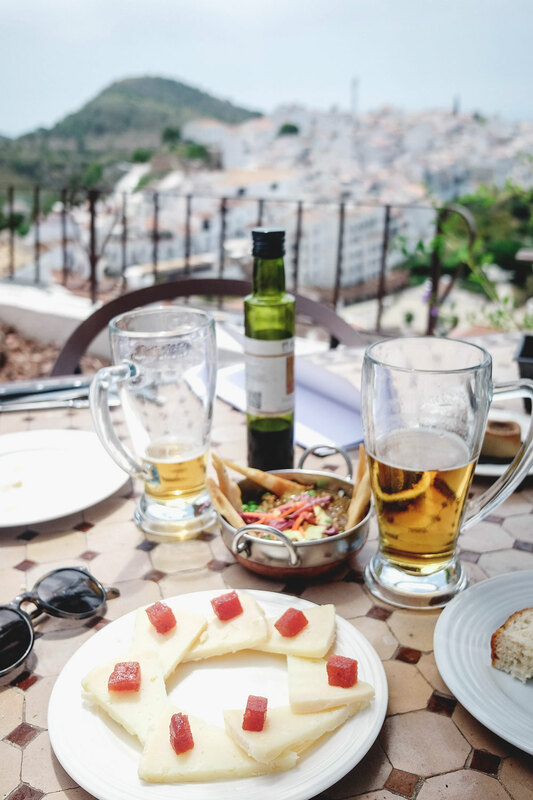 Happened with Crete when we were mapping out Greece, with Montepulciano when we were organizing Italy and for this last adventure in Spain, it was a snap of Frigiliana that literally made me swoon. I knew we had to go here and at the end of the day, we were both in unanimous agreement that it was one of the absolute highlights of our entire trip. 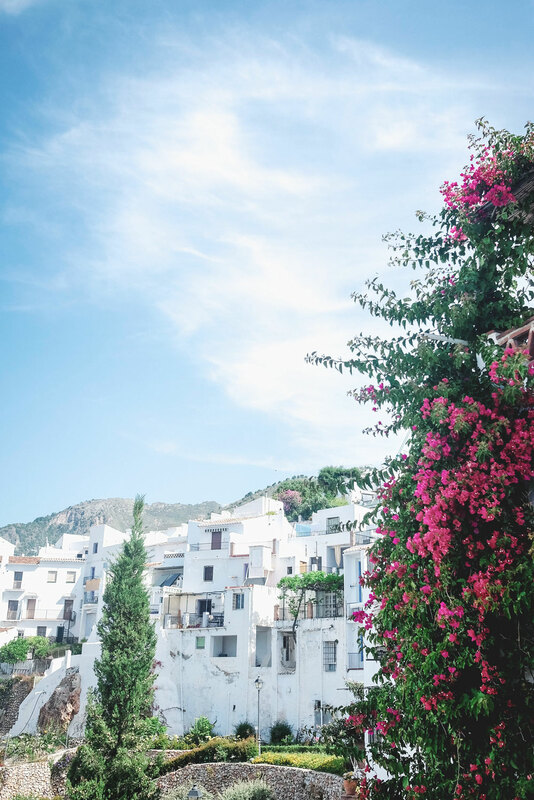 Costa del Sol is the southernmost coast of Spain, aptly named for its strong Spanish sun (directly translating to “Sun Coast”). It’s literally a hop, skip and a jump away from Africa, with Morocco right across the water. Think stunning beaches with turquoise waters, whitewashed Mediterranean hilltop towns and breathtaking cliffs to take it all in from. 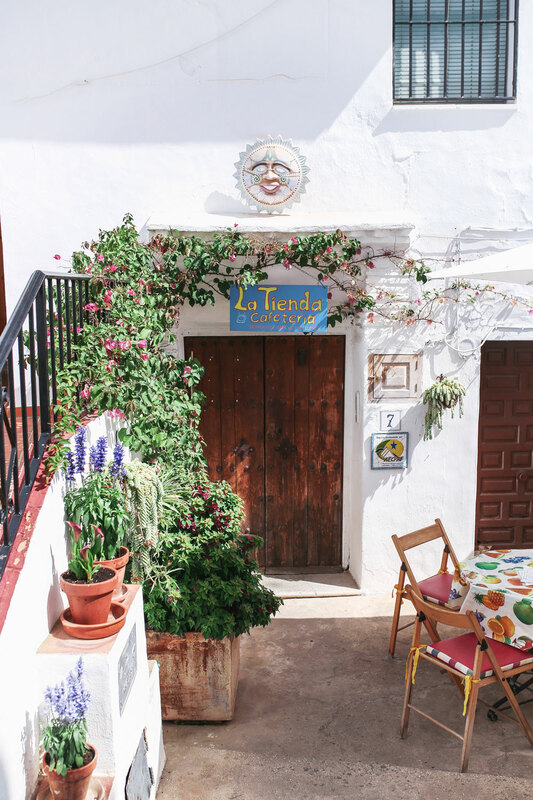 If you don’t have time to spend a night or two here, do as we did and do a road trip from Granada! And on that note, while there are some bus options to get here (trains are tricky to the small towns not on the coastline i.e. not really an option, just to the larger towns of Marbella, Gibraltar, etc), can not recommend our experience with Enterprise enough. We rented a car from the Enterprise office in Granada and they were so amazing—let us drop off after hours, we had an amazing luxe BMW to drive and the price was really reasonable! 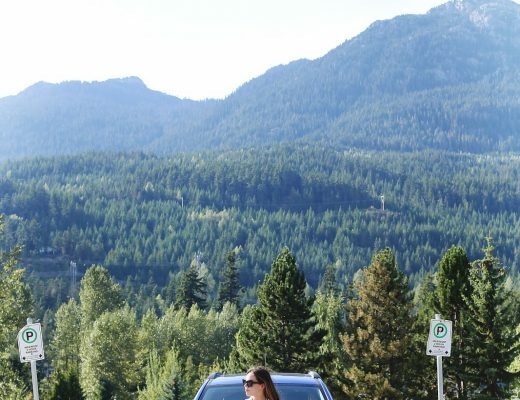 Always a good idea to have an international driver’s permit but we weren’t asked for one when booking (as usual, have never actually been asked—we just make sure to have it as a precaution!). 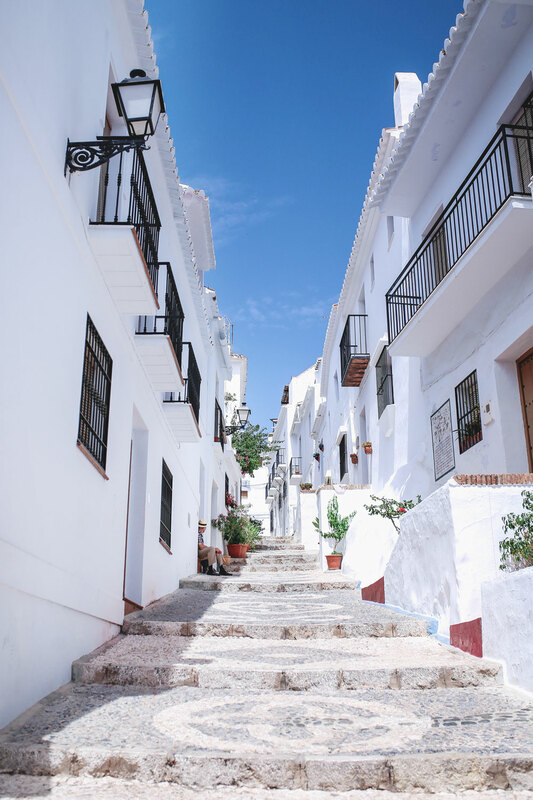 The drive is only an hour and a half from Granada to our first stop of Frigiliana (and lots of parking options at the town base when you get in plus the highways were amazing) so if you’re unsure about renting, I’d really urge you to consider it because it was really a breeze for us! 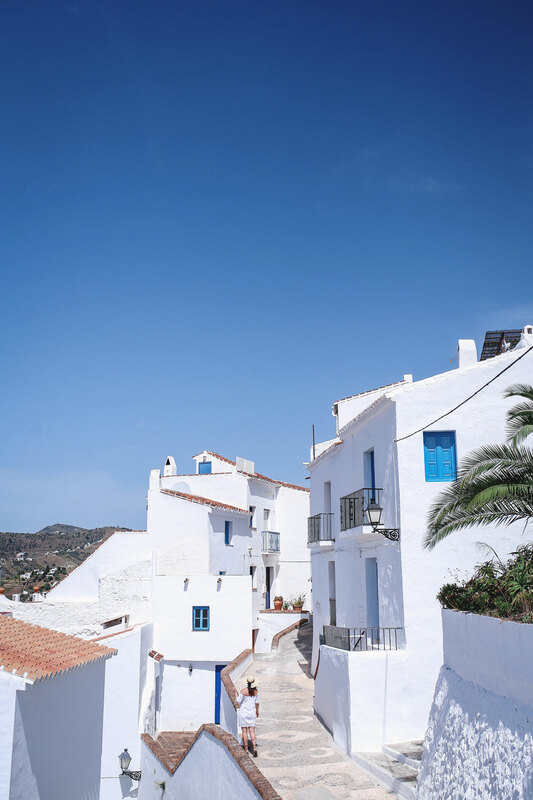 I’m so grateful I stumbled upon Frigiliana on Pinterest because it might be one of my favourite places ever. Wandering along its clean, whitewashed streets (with aquatic motifs and beautiful designs in their cobble stoned streets), winding up its steep hills and poking our head around corners to discover tiny hidden streets branching off from the main walkways, bougainvillea exploding overhead into the streets, painted doors in various shades of aqua, blue and turquoise—it was seriously such a dream. We popped into The Garden Restaurant for a delicious Moroccan-infused meal and a couple drinks while taking in the incredible view below—such a special memory! Learn from our mistake and go early in the day! Because we deliberately tried to plan this day on the run so that we could just wander aimlessly to different places along the coast before heading home, we didn’t realize that the famous Caves of Nerja closed so early in the day (though that makes sense obviously since they’re protected sites and caves so limited by daylight!). Ancient Palaeolithic paintings and ancient human and animal remains were found here by accident by a group of friends in the ‘50s and now you can walk in and see it for yourself. We were so bummed we missed out on this (we even drove there to see if we could try to convince them to let us in late, but my usually strong persuasive skills sadly failed). 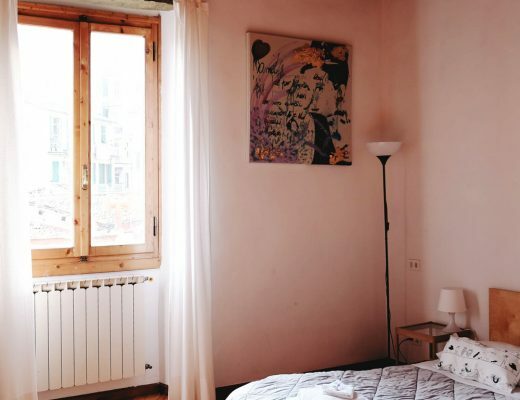 So go maybe first thing in the day if you plan a similar 1-day trip! 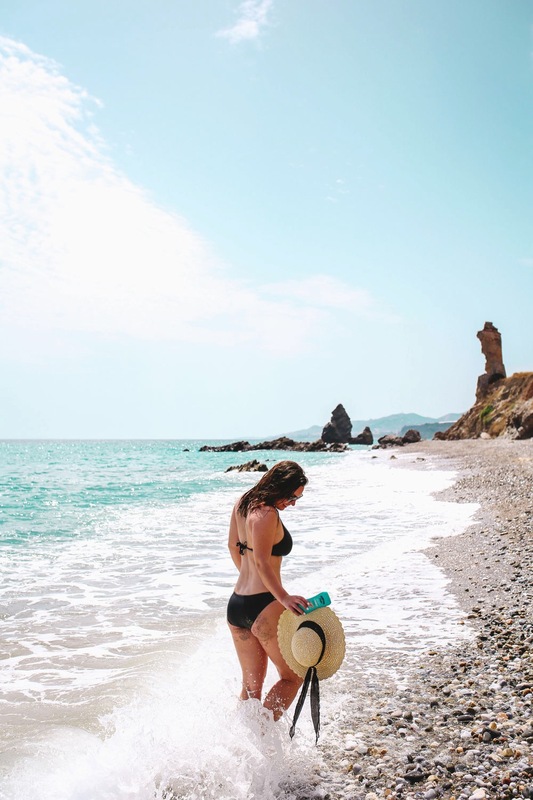 Given that this is a coastline, there are some seriously incredible beaches here—there are a ton near the cities (Nerja has so many and they’re all lovely too!) but I kind of fell for Playa de las Alberquillas. I really love hidden, quiet spaces (not really ever looking for buzzing zones) and other than seeing more elderly male genitalia than I’d bargained for (a bit of a nudist area so just be aware if you’re bringing kids! ), it was honestly a dream (I mean, unless you’re into the 70+, sun-weathered crowd, than maybe that other element would’ve been cool too). But you could honestly just drive along the highway and pop into any beach along the way! Just make sure you have flip flops because the rocks/sand are toasty. 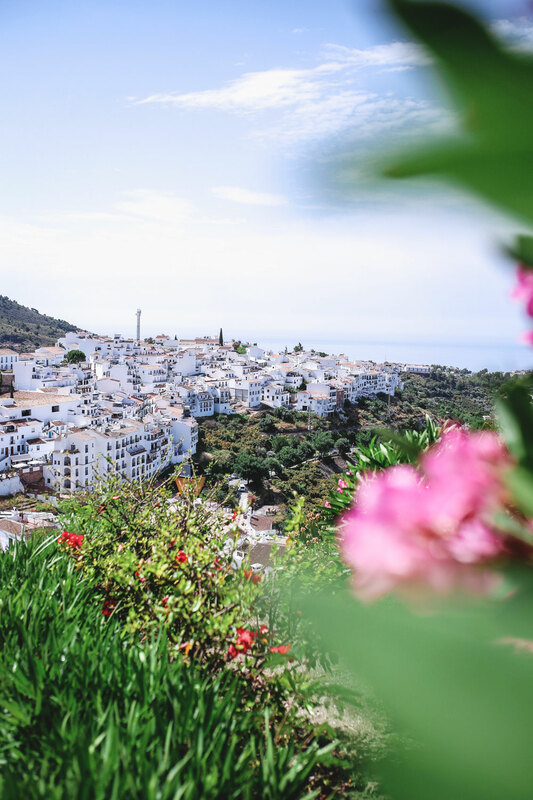 Other notable towns that we didn’t get to go to are Marbella, Torre del Mar and Málaga—it’s all so beautiful, even if we were whizzing by in the car! We also didn’t get a chance to do the Sierra Nevada National Park which we heard was amazing! 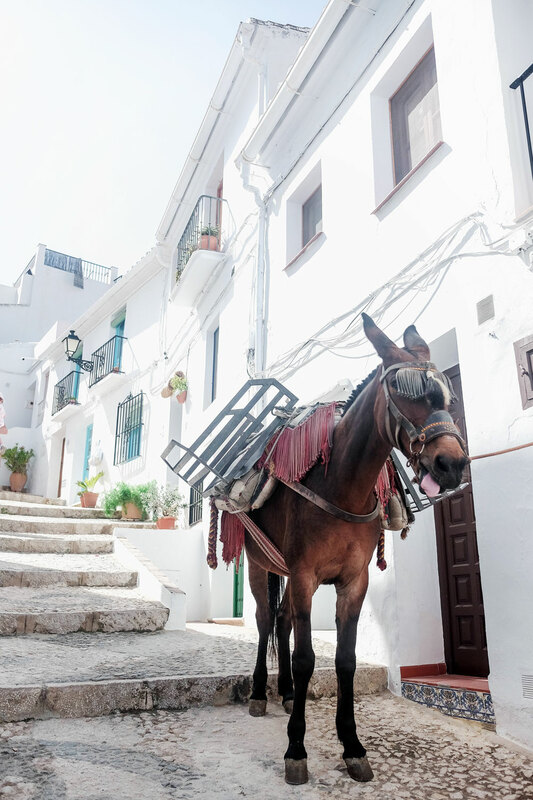 But again, on limited time you can totally have a full day of sightseeing (pick 1-2 towns like we did, and seriously, can’t recommend Frigiliana enough! 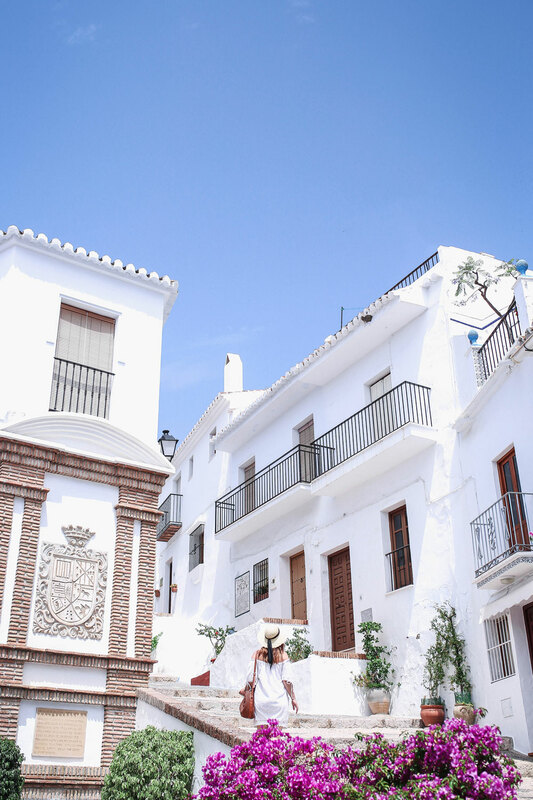 ), have a leisurely lunch and then do a few beaches before heading back to Granada. Granada is such a great place to use as a launchpad for visiting other towns from what we researched as well and a lot of tours depart from there if you don’t want to take a car so if you haven’t checked it out already, make sure you stop by my Granada guide to get the low-down on the city (including my recommendations on where to stay!). 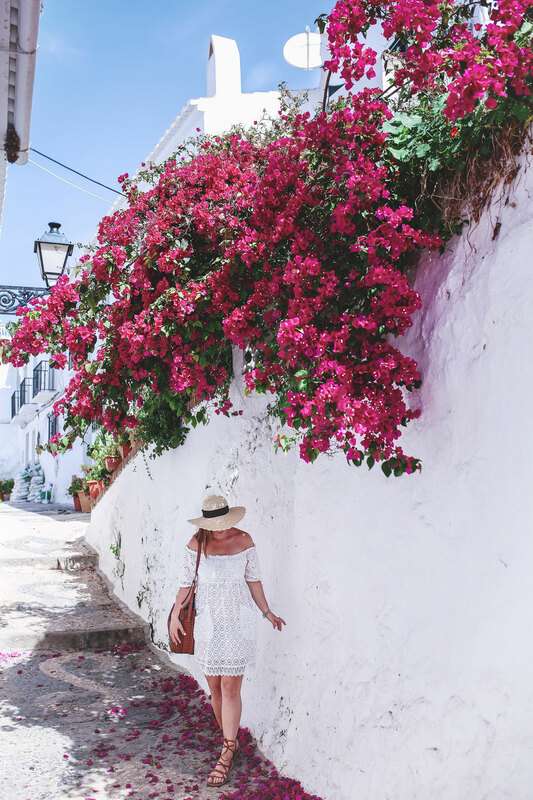 Finally, my whole Andalusia category is right here so that you can plan your trip there—such a special place in the world and to me! Omg gorgeous photos!! 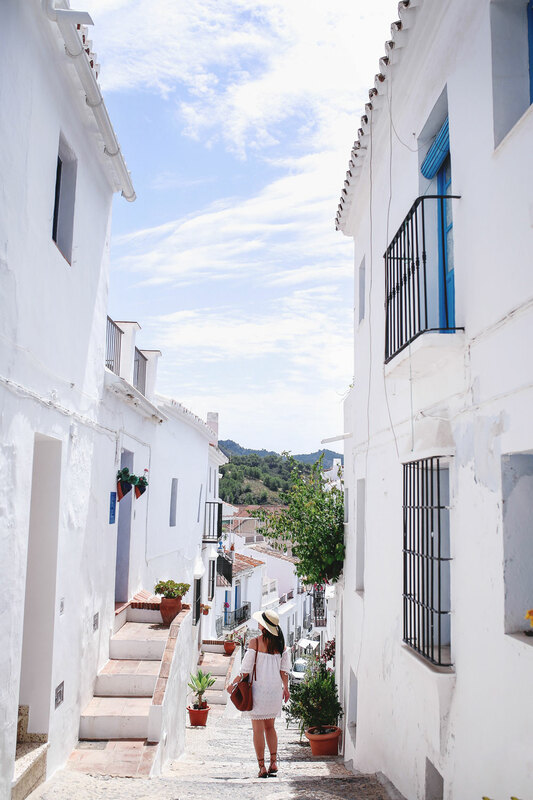 Makes me want to book a trip to Spain asap!